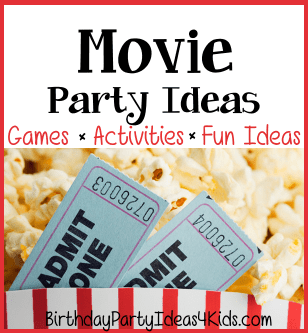 Movie party ideas for kids birthday parties. Great ideas for kids, tweens and teens that love movies. If you are watching a movie these games can be played during the movie as intermission times. Place a large popcorn bucket away from the party guests and see who can make different shots into the bucket with pieces of popcorn. Keep moving the bucket farther away until no one can hit it with their popcorn. Give away small prizes such as glow in the dark bracelets for the winners. Buy a large inflatable beach ball and in permanent marker write movie trivia questions all over the ball. During an intermission have the guests throw the movie trivia ball back and forth to each other and see who can answer the questions. Try and make the trivia questions about the movies you will be viewing during the party. You can also add personal questions such as: What's the scariest movie you’ve seen? Favorite actor? Movie that begins with first letter of your name? Time party guests to see who can move 20 pieces of popcorn from one bowl to another by using only chopsticks. Award the winner a small prize. In several bowls place different kinds of movie candies. Cut them into small pieces. Blindfold party guests and serve them a small taste of the candies. The kids must try and name the candy that they have tried. 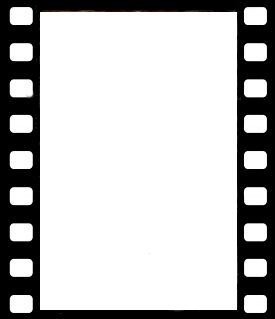 Make invitations from a Movie ticket template (check Google images). Print out invitation information on a large label and stick on a package of microwave popcorn or large boxes of movie size candy. Make a plain white note card look like film strips by gluing black paper on either side of the card and then on top of the black strips glue small white squares about 1/8" apart. Write or print party information on the front in a fancy font. Make a large poster from several large poster boards, foam board or butcher paper that looks like a movie marquee and hang it on the mailbox or over the door to the party venue. On the sign use the font type like the marquees use and spell out ... "Now Showing", "__________'s Birthday Party", "Show Time _______ (time of the party) , "Rated G" . Pop popcorn and sprinkle it on the walkway leading to the party entrance. Make a red carpet from poster board or red fabric and place it down on the walkway leading to the party. Decorate the Movie party area in black and red. Red tulle can be draped along one wall in back of the TV you will be using to watch movies so it looks like a curtain in the movie theater. Make a Hollywood sign out of white poster board (one poster board for each letter) and hang on the walls of the party room or place outside so guests can see it when they are entering. You can let it say "Hollywood" or change it to the name of the person having the birthday. Make a Hollywood "Walk of Fame" by drawing stars on poster board, decorating them with stars names and placing them on the floor. Ebay has some fun life size movie star cutouts that you can buy and then let party guests take pictures with the "movie star".